Some 174 million digital records were compromised by data intruders in 2011, according to Verizon's annual data breach report. The number of records clipped by cyber criminals increased by more than 4,000 percent over 2010, when only four million records were compromised. The large increase in data thievery can be attributed partially by hacktivist activity during the period. According to Verizon, 58 percent of the 855 breaches studied in the report involved data stolen by hackers. Although a large number of records were compromised in 2011, the year was only the second-highest since Verizon began collecting breach information in 2004. Despite the volume of records stolen, the monetary damage resulting from the breaches appears to be minimal, according to the report. "While a few 2011 breach victims estimated their losses to be in the hundreds of millions of dollars, most did not get near to that amount," it said. "In fact, the large majority of them emerged relatively unscathed from their troubles." More than ever, personal identifying information has become a target of digital criminals, Verizon researchers said. Some 95 percent of the records robbed by intruders in 2011 contained information such as a person's name, contact information and social security number. That compares to 1 percent in 2010. 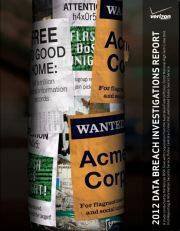 Two disturbing findings in the report were how many of the data breaches were opportunistic (79 percent) and how many were totally avoidable (97 percent) without the victimized organizations needing to launch difficult or expensive countermeasures to foil the data bandits. What's more, most of the breaches (96 percent) could be performed without any advanced skills or extensive resources. "While they were inconvenienced and probably had a sleepless night or two, they returned to normal business operations before too long," the Verizon report added. "With the participation of our law enforcement partners around the globe, the 2012 Data Breach Investigations Report offers what we believe is the most comprehensive look ever into the state of cyber security," Wade Baker, Verizon's director of risk intelligence, observed in a statement.